I bought feta a few days ago because I was going to make this huge salad that just never ended up happening. I was making chicken last night and thought to myself…. let’s use that feta! Here’s what I came up with. I also want to say that I never really measure when I cook. If I have 3/4 of an onion I would use that. Sometimes I want more tomatoes – so I go with it. Don’t feel like you have to EXACTLY follow any recipe. The baking ones are the only recipes where you need to be accurate. Cooking dinner is more of a “whatever is on hand” kind of thing. Ok – onto the HOW TOs. 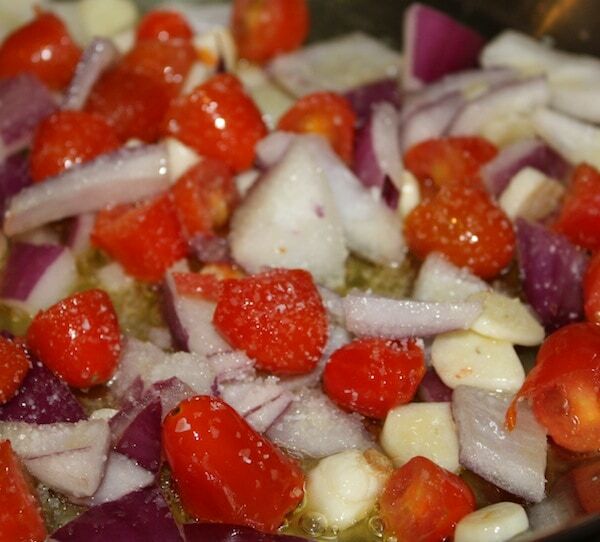 Put 2 tablespoons of oil and sauté the tomatoes, red onion and garlic over medium heat. Salt and pepper. You want to cook this until the garlic is soft and edible. Every time it looked like I was running low on oil I would just add a little black tea. It’s no calories and is a great add on. If you don’t have black tea, use chicken stock. Or if you aren’t calorie counting – put a little more oil. Meanwhile, season up the chicken with your dried herbs, salt and pepper and brown with remaining oil. I recently bought a cast iron pan and it’s life changing. Again, I kept adding tea whenever I felt the pan got too dry, buy you can use more oil or chicken stock. 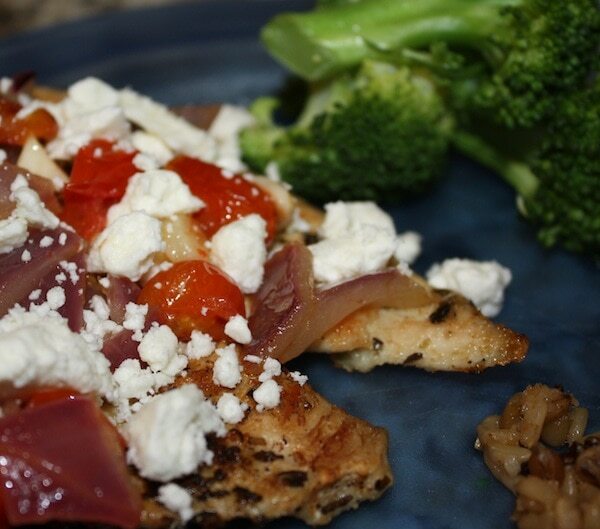 Once the chicken is browned, you can plate and top with the vegetable mixture and then put a handful of crumbled feta to finish up the plate. I made brown rice and steamed broccoli and it was SO GREAT! 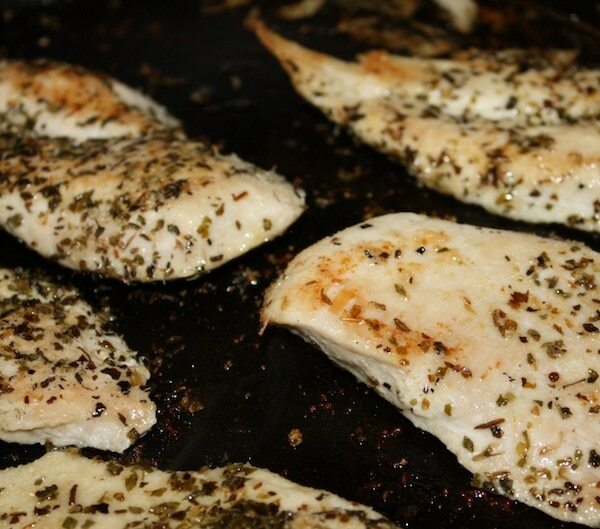 This is a super easy chicken recipe and can be made with whatever you have on hand. 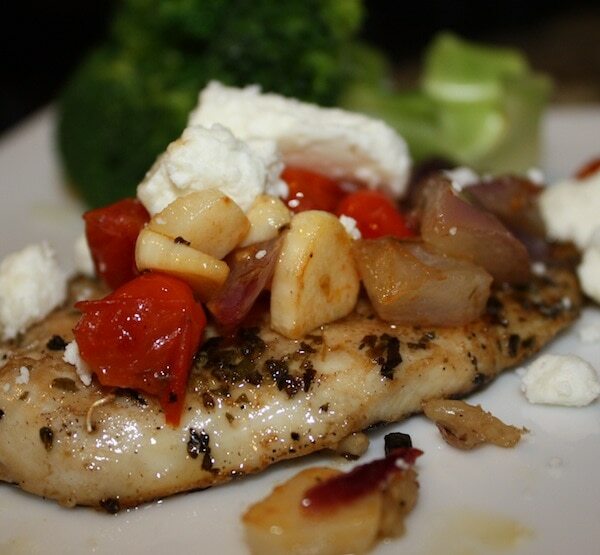 If you don’t have feta – use mozzarella! Or goat cheese! 🙂 Possibilities are endless. Previous Post: « Happy New Year!! I am obessesd with feta and girl, it makes anything taste better! Thi sounds super yummy! I am goin to try it tonitght! Thanx for sharing!!! I just made this and it was DELISH.